He dedicated himself to the sport from a young age, before the boxing and then to cycling, competing until late in life. It was during a Six Days in Dortmund in 1936, to feel the first symptoms of the blindness. Became blind, he managed to get into the history of cycling as a massage therapist and trainer of champion cyclists. Cavanna was Fausto’s cycling father and the most important influence on his cycling career. There are at least four versions of and several different dates for the first meeting between Cavanna and Faustino Coppi (the young Coppi). The masseur and the young met between the end of 1937 and the summer of 1938. 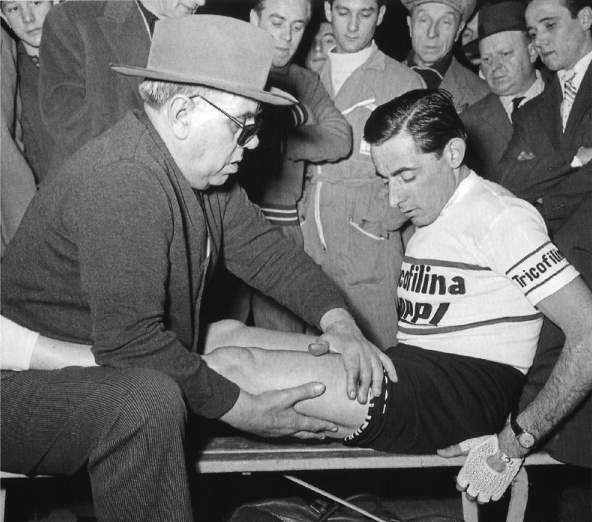 It was a key moment in Coppi’s story, probably the single most important event. Cavanna was a talent scout, tactician, trainer, soigneur, team manager, masseur. Behind his back he was called “l’umon” – dialect for l’omone, big man. There were other nicknames: the “Miracle Maker“, the “Muscle Wizard“, “Wizard of Novi“, and “one-eyed visionary” – for his ability to interpret the body of an athlete feeling it with just his hands. The premature death of Fausto Coppi upset him deeply and pushed him out of business. He died almost two years after his best student. Giovanni Rossignoli (3 December 1882 – 27 June 1954) was an Italian professional road bicycle racer who won 3 Giro d’Italia stages during his career. He was also the hidden winner of two Giri d’Italia. Alfredo Binda (11 August 1902 – 19 July 1986) was an Italian cyclist of the 1920s and 1930s, later manager of Fausto Coppi and Gino Bartali. Along with Giovanni Brunero and Carlo Galetti, Binda was among the first multiple Giro d’Italia champions, securing five victories between 1925 and 1933. Handsome, rugged and talented, Alfredo Binda was undoubtedly the first superstar of the Giro d’Italia. A popular rider, Binda essentially became the archetypal modern stage racer way before his time. The legacy he left cycling with was his ability to combine the strength of a one-day Classics rider with an incredible climbing prowess. Fotheringham, W., Fallen Angel – The Passion of Fausto Coppi, Yellow Jersey Press, London, 2010.